This time this show has come with the story of Dara Shukoh: A Forgotten Hero of Indian Cultural. Dara Shikoh was the eldest son of the fifth Mughal Emperor Shah Jahan. 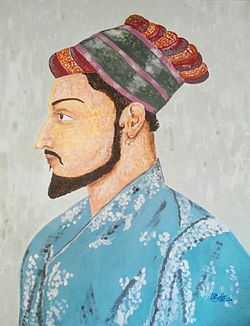 He was favoured as a successor by his father, Shah Jahan, and his elder sister, Princess Jahanara Begum, but was defeated and later killed by his younger brother, Prince Muhiuddin (later, the Emperor Aurangzeb), in a bitter struggle for the imperial throne. Dara’s was a unique and marvelous personality among the Mughal royal family. He was entirely distinct in all respects from other princes of the entire Mughal family. he had qualities of his two great ancestors Humayun and Akbar. The habit of passing more and more time in the Library to acquire knowledge was inherited by him from Humayun while the interest in comparative religions, universal brotherhood, humanism and peace, came from the great emperor Akbar. Dara was well versed in Quran, Persian poetry and history. He was also a patron of fine arts, music and dancing, a trait frowned upon by his sibling Aurangzeb. On 1 February 1633, Dara Shikoh married his first cousin, Nadira Banu Begum, the daughter of his paternal uncle Sultan Parvez Mirza.The couple had eight children, of whom two sons and two daughters survived to adulthood. On 10 September 1642, Shah Jahan formally confirmed Dara Shikoh as his heir, promoting him to command of 20,000-foot and 20,000 horse.In 1645, he was appointed as subahdar(governor) of Allahabad. He was promoted to a command of 30,000-foot and 20,000 horse on 18 April 1648, and was appointed Governor of the province of Gujarat on 3 July. As his father’s health began to decline, Dara Shikoh received a series of increasingly prominent commands. He was appointed Governor of Multan and Kabul on 16 August 1652, and was raised to the title of Shah-e-Buland Iqbal (“King of High Fortune”) on 15 February 1655.He was promoted to command of 40,000-foot and 20,000 horse (roughly equivalent to general) on 21 January 1656, and to command of 50,000-foot and 40,000 horse on 16 September 1657. His increasing popularity among masses has lead serious power fight between the brothers. Despite strong support from Shah Jahan, who had recovered enough from his illness to remain a strong factor in the struggle for supremacy, and the victory of his army led by his eldest son Sulaiman Shikoh over Shah Shuja in the battle of Bahadurpur on 14 February 1658, Dara Shikoh was defeated by Aurangzeb and Murad during the Battle of Samugarh, 13 km from Agra on 30 May 1658. Subsequently Aurangzeb took over Agra fort and deposed emperor Shah Jahan on 8 June 1658. Dara was brought to Delhi, placed on a filthy elephant and paraded through the streets of the capital in chains. Dara’s fate was decided by the political threat he posed as a prince popular with the common people. A convocation of nobles and clergy, called by Aurangzeb in response to the perceived danger of insurrection in Delhi, declared him a threat to the public peace and an apostate from Islam.He was assassinated by four of Aurangzeb’s henchmen in front of his terrified son on the night of 30 August 1659. After his death, he was beheaded. Dara was a spiritual person.This led him to study the Upanishads and with the help of some scholars of Benaras he translated 50 Upanishads from Sanskrit to Persian. He was having the firm opinion that Upanishads and Quran give the same message of humanity. Dara was a gentle and pious Sufi intellectual and perhaps the greatest representative of Indian cultural synthesis.If he would have defeated his orthodox brother Aurangzeb, India today would have been different .